In the past several years, some networks have thrived, some vanished, while hundreds of new ones appeared. 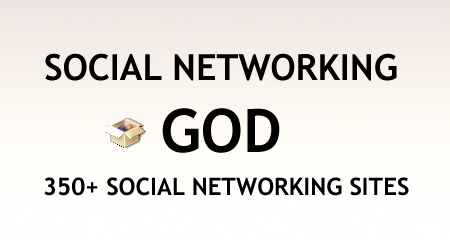 It has become a huge area to follow, and this article illustrates this well: a collection of over 350 social networking sites. Americabookshelf.com – One of the largest book exchange clubs across the US. BooksConnect – A book sharing community site connecting readers, authors, publishers, librarians and booksellers. Bookhopper.co.uk – Free community for UK residents to share used books with each other. Booksalescout.com – Online community of users allowing them to sell books in the US. Bookswim.com – Book borrowing service with free shipping for registered website. ConnectViaBooks – A social networking site connecting book lovers and enabling them to discover other similar interests. PaperBackSwap.com – Users can share books amongst each other and only pay for the delivery charges. Pazap.com – A book trade engine for students to buy and sell old books. Revish – Revish is another community for book lovers, letting them review their favorite books, group up, or simply tell the world what they’re currently reading. Shelfari – Shelfari is a popular social networking service for book lovers. AdvisorGarage – It is an online directory of advisers who are willing to assist budding entrepreneurs. Blogtronix – Blogtronix promotes corporate social networking, enterprise 2.0 and wikis. Commutal – Commutal is an online sharing platform for businesses to create media rooms, participate in domestic groups and share event happenings with each other. CompanyLoop – An online co-working community for global businesses. ConnectBeam – Connectbeam offers social networking specially designed for corporate users. Decorati – An interior designer community enabling users to post items for sale and for exchange. DoMyStuff – A good site for working professionals looking to find online assistants. Doostang – An invite only career community for professionals. Fast Pitch – It is a quickly growing business networking community in corporate world. Its online provides users with a one-stop shop network to market their business. iKarma Inc. – iKarma is a specialist in providing customer feedback for organizations and professionals. Jambo – Jambo lets you connect with your neighborhood friends. Jigsaw – An online business card networking directory for users to establish contacts with each other. Each business card is listed with an email id and a contact number. Konnects – Konnects enables members to create their own professional networking communities. Linkedin – LinkedIn is a professional social networking website for business users, one of the most popular such sites out there. Some aspects of it are free, but many are paid. mediabistro.com – mediabistro.com is for professionals in content or creative industry. Pairup.com – Pairup connects business travelers assisting them to travel together. Ryze.com – A site for establishing new connections and growing networks. Connections for jobs, building career and making sales. Spoke.com – Spoke offers access to business network of over 40 million people worldwide. Visible Path – Visible Path helps organizations to integrate social networking into their existing tools. WebCrossing Neighbors – It provides a private label social network with personal spaces and user groups. XING – XING is a networking directory of business contacts powering relationships between business professionals allowing users to connect with each other. Amiglia – A family networking service enabling users to connect to family members by publishing and sharing family trees, photos etc. Cingo – Cingo users connect with each other to organize their family life. CommonGate – A social networking platform that enables users to create their own social network for their friends, family or organization. Family 2.0 – Family 2.0 helps you create your own family social network, you can add family members, send personalized emails and create event alerts. Famiva – A premier social network to connect with family members and relatives in a secure environment. Geni.com – An exciting social networking site enabling members to create their family tree. Although it’s a relatively new site, it has grown tremendously fast, and has hundreds of thousands of users. Genoom – Genoom creates a meeting place for its site users. They can create a family network by inviting their relatives and discover their past memories. Kinzin – Kinzin is an online meeting place for families to share family events, photos, stories and recipes. MayasMoM – A family networking site for parents. MomJunction – MomJunction allows mothers to find reliable answers to questions, create private spaces with friends and build communities. MothersClick – MothersClick connects mothers in a neighborhood with each and provides parenting advice to them. Parentography – A social network offering advice and advice for families. 43 Things – A tagging based social networking site. Users create accounts and list a number of goals or hopes and these are parsed based on similarity to goals of other users. Amitize.com – Amitize is a worldwide friendship network. aSmallWorld – aSmallWorld is a private online community designed for individuals who would like to connect, re-connect to share similar thoughts with each other. Badoo.Com – Badoo is a dynamic multi-lingual social networking site with innovative photo and video features that allows its users worldwide to gain an instant mass audience and interact both locally and globally. Bebo – Bebo is a hugely popular site (especially in the UK), and similar in philosophy to MySpace. It allows users to communicate with their friends in multiple ways including blogging, sending messages and posting pictures. Eons – An online gathering place for the elderly; most of the users are over the age of 50 years. Facebook.com – Facebook is a social networking phenomenon connection people with their friends, family and other users with similar interests. Faceparty – A UK based community social networking website. It started for youngsters but has now risen to popularity among all age groups. Flingr – Flingr allows users to connect with all categories of friends – colleagues, college mates and school buddies. Friendster – It is a popular global social network for finding new friends and developing friendships as well as searching old friends. hi5 – Hi5 is a prominent social networking service in India with over 40 million users. However, Hi5 has recently experienced an upsurge beyond India and has shown increasing popularity in EU too. Lovento – Lovento allows you to discover news friends and also find information about latest events. Multiply.com – Multiply is a social networking website providing easy way to share digital media which includes photos, videos and music. Mycool – Mycool enables members to find and share their interests with special groups. MySpace.com – MySpace is an interactive social networking website consisting of personal profiles, blogs, groups, photos, music and videos. It’s currently the biggest social networking site out there, and while it might not be the most advanced one, the users seem to love its simplicity. NetFriendships.com – A comprehensive social networking site enabling users to make new online friends and discover old ones. Netlog – A social community of more than 20 million young Europeans. Orkut – Orkut is a social networking service owned by Google. It enables users to meet new friends and create communities. Passado – Passado is Europe’s no.1 re-union website connecting members with friends from school to workplace. Piczo – Piczo offers safe social networking environment to youngster around the world. Piczo users can design their personal website with photos, videos etc. and share it with their friends. Plazes – A social networking website for connecting with local users. Pownce.com – Pownce is a mix of social networking and microblogging. It enables users to send messages, files, events and links with each other. ProfileHeaven.com – A UK based social networking site for teenagers. reunion.com – A leading online service for discovering old friends, classmates and family members. Vox.com – Vox is a social blogging service where users share their ideas, photos, videos with family and friends. Xanga – Xanga is one of the biggest social networking platforms with features of sharing photos, photos and videos. XuQa – An online college social networking site with poker gaming features. ActionProfiles.com – It is social networking community for sports and action. The features of the website are profiles of users with photographs and videos, reviews of products and job discussion boards. Arts community – Arts community provides a dynamic community experience by providing extensive listing of exhibitions, events and openings. BeGreen – BeGreen is a community that aims to generate environmental awareness for users. beRecruited – beRecruited is a dedicated online community for sportpersons and coaches. BottleTalk – BottleTalk is a wine lover’s community making it easy for members to share their drinking experiences. CarGurus – An automobile community website enabling users to post car reviews, photos and share opinions. Change – Change is a nonprofit social networking website that connects like minded users and allows them to exchange information. ChangingThePresent – A nonprofit fund raising community with membership of over 400 nonprofits. ChickAdvisor – ChickAdvisor is a sharing community for women users. CircleUp – CircleUp is one of the best community website connecting users to groups, clubs for knowledge sharing, information exchange. Coastr – Coastr connects beer lovers with each other. ColShare – ColShare is a community for people who have hobby of collecting items like coins, stamps etc. coRank – A rating community for users to share interesting information on internet. DailyStrength – A huge community of over 500 groups dealing with health issues and various medical challenges. Dundoo – Dundoo enables users to create image collages out of social networking profile. A big amount of ads on the site somewhat diminishes the overall impression. Flixster – Flixster is a community for movie lovers. FuelEmpire – FuelEmpire brings automobile enthusiasts together at one place. GirlSense – A community for girls to promote their fashion designs & creations. Greenvoice – An online networking platform for people who are conscious about the environment, who want to inform each other on environmental issues and create a difference. iYomu – iYomu is an adult social networking website and it allows users to search for site members who have similar interests or for business needs. Motortopia – Motortopia is community for automobile lovers. It consists of passionate lovers of bikes, planes, cars and boats etc. MyCatSpace – MyCatSpace is a community for lovers of cats passionate to share experiences of their cats with others. MyDogSpace – MyDogSpace users can share their dog pictures, write blog posts about dogs and communicate with other dog lovers, all in a very lovely community. Uniteddogs – A social networking website for dog owners. The dog owners can creae profiles of their dogs, create blogs and share their thoughts. vSocial – vSocial is a video based social networking platform allowing content owners, site operators to deliver the message online with video. Buzdeo – Buzdeo provides secure video sharing service with friends and family. Fotki – A photo sharing service enabling users to connect with friends. Fotolog – A big online photo sharing community. Asoboo – Asoboo is a sharing network for cultural artists from around the world. BandChemistry – A network for musicians uniting music bands all over. BandWagon – BandWagon is a music community website for music fans to manage their web pages, profiles, videos and music. CrackSpace – A common place for fans of hip-hop music. Moob – A dedicated community of hip-hop fans. MOG – An online community powering site members to discover music and music lovers. CrackBerry – A community dedicated to BlackBerry users. Dodgeball – A New York based service facilitating social interactions through mobile phones. Friendstribe.com – A mobile phone based social networking site. GotZapp – A mobile social network for sharing images, audio and graphics with your friends’ mobile phones. Groovr – An ultimate mobile social networking site for staying connected with friends. It is compatible with iPhone. Jaiku – Jaiku is essentially a microblogging service with an SMS gateway, very similar to Twitter. They’ve recently been acquired by Google. Loopt – Loopt is a cool mobile based friend locator website. It uses GPS to show its users the location of friends by updating maps on mobile handset. Mixxer – Mixxer enables users to content on their mobile with site members. Mobango – A mobile community service powering users to search for user generated music content, videos and other data. Mozes – Mozes enables members to connect & socialize with each other through mobile phones. Partysync – Partysync helps users to interact with people using mobiles. Peepsnation – Peepsnation allows users with similar interests to connect with each other on location basis. Rabble – A location based social networking service for mobile phone users. Socialight – Socialight is a mobile based social networking site where users share their travel experiences with other mobile users. Wattpad – A mobile phone social networking platform allowing users to discover, read and share their stories with each others. 3LUXE – A community generated product research site. AgentB – A common place to find out the best shopping deals on internet. bringsome.com – A global goods delivery platform enabling community members to assist each other with access to best items from across the world. boxedup.com – Boxedup.com users add their favorite products to their list and share it with others. CoWorkersAds – An online marketplace listing allowing site members to discover and sell items among coworkers community. iliketotallyloveit.com – A user generated marketplace where users submit cool products. MyItThings.com – A user generated magazine for shopping. MyStore.com – A social market place for buyers and sellers. Productwiki.com – ProductWiki is a common place for users to share information about consumer products. RedFlagDeals.com – RedFlagDeals.com is Canada’s most popular shopping community which offers huge discounts to site users. Sale Grab – SaleGrab is a social shopping site for best sales and discount deals. Shoppero – Shoppero offers profit sharing to site users for writing product reviews. Smashing Darling – A collaborative market place connecting buyers and sellers at one place. AlumWire – AlumWire has been created to assist college students, alumni with professional opportunities. B4Class – A social network for high school and college students. Campusbug – A college student social networking website. CampusRank – CampusRank members select and rate their old school friends and group them into various categories. College.com – An online community for college students. CollegeMedium.com – A student classifieds website for buying and selling items, jobs search etc. College Tonight – A great place to meet fellow college students and alumni. DormItem.com – A local classifieds listings for schools in various cities. Graduates.com – A social networking site assisting graduate school students to stay in touch post completion of course. Half.com – A leading student market place for buying and selling textbooks at discounted prices. iHipo – An international community for college students and business professionals looking for networking opportunities. LocalSchools – A networking site connecting students with local US colleges and universities. Pazap.com – A student trading site for buying and selling on-campus books with other students. Quizilla – Quizilla is a social network for young teens. RateMyProfessor.com – RateMyProfessor connects students aspiring to study similar courses by assisting each other. Student.com – Student.com is a big online community for college students, high school students and teens with around 1,000,000 members. Studentbid.com – Studentbid.com is a student market place for sales and purchase of items without any fees. StudentSN.com – A social network allowing users to create home pages with contact information, personal information and photo albums. Uloop.com – Uloop allows students to trade textbooks, promote community events and do host of other activities. Amicoz.com – Amicoz is slightly different from conventional social networking sites; it doesn’t have some of the common features found on socnets. It is dedicated to assist users in sharing their travel experiences, nothing more, nothing less. Citizenbay – Citizenbay is a user community for discovering local information. CityTherapy – CityTherapy is an easy way to find and share places of interest (restaurant, bars) in Europe. CouchSurfing – A global travel network connecting travelers with local communities. fatdoor.com – A fun and an interactive way to connect with the folks from your neighborhood online. Going.com – A fun way to interact with people locally. iloho – An online travel community with similarity to social bookmarking services like digg. MatchActivity – A site connecting people on the basis of their activities. Users can find things to do and join people in their area. Matador – A travel based social network with an integrated blogging service. myTripbook.com – myTripbook.com is a place for people who want to share their travel experiences through photos, videos and blogging with others. OurFaves – OurFaves is a community of urban savvy folks who enjoy the Toronto city and find out cool places to hang out at. Outside.in – A nice way to explore local communities to keep track with neighborhood news. Rummble – Rummble enables users to discover as well as share places of interest in your neighborhood. TravBuddy – TravBuddy is a cool site for sharing travel experiences, finding new travel friends or reading travel reviews of fellow friends. Travellerspoint – An international meeting point for worldwide travelers. TravelTogether – A travel based social networking service enabling users to share travel plans, travel deals and experiences. tribe.net – Tribe.net is one of the easiest ways to connect with people for finding a restaurant, a killer apartment, a gentle dentist or a hiking friend. TripUp – A travel community site for finding travel information and planning for trips. VibeAgent – VibeAgent is a site about hotel reviews, travel meta-search and social networking. WAYN – A social networking website uniting world wide travelers. WeExplore – WeExplore provides an online platform for volunteers and travelers from all over the globe. Wikitravel – Wikitravel is dedicated project for creating a trusted, up-to-date travel guide. It has over 16,641 travel destination guides maintained and written by Wikitravellers from around the world. Zoodango – Zoodango is a website enabling users to connect with urban professionals either online or face-to-face at local venues. Nice post! Truly that social network community often grows through viral marketing. Your members will invite their friends, and hence you can reach a large number of people with a very limited marketing budget. But even more thrilling is the fact that once members connect within a social network community they will stay there. This extreme customer loyalty makes social network communities highly valuable.